Geoffrey Koziol, The Politics of Memory and Identity in Carolingian Royal Diplomas: The West Frankish Kingdom (840-987). Utrecht Studies in Medieval Literacy 19. Turnhout, Belgium: Brepols, 2012. xix + 661 pp. Map, figures, notes, bibliography, and index. $145.00 U.S (cl. ); 100.00 €. ISBN 978-2-503-53595-1. Hans J. Hummer, Wayne State University. Brigitte Bedos-Rezak, New York University. Constance B. Bouchard, University of Akron. Richard F. Kuisel, The French Way: How France Embraced and Rejected American Values and Power. Princeton, N.J. and Oxford: Princeton University Press, 2012. xxii + 487 pp. Figures, notes, bibliography, and index. $49.95 (cl). ISBN 978-0-691-15181-6. Rebecca Pulju, Kent State University. Stephen Harp, University of Akron. Helke Rausch, University of Freiburg. Seth Armus, St. Joseph’s College (New York). 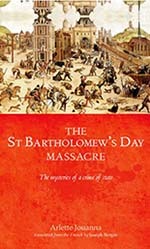 Arlette Jouanna, The Saint Bartholomew’s Day Massacre: The Mysteries of a Crime of State, trans. Joseph Bergin. Manchester, U.K. and New York, N.Y.: Manchester University Press, 2013. xiv + 271 pp. Glossary, appendix, bibliography, and index. $100.00 U.S. (hb). ISBN 978-0719088315. Dominique Godineau, S’abréger les jours. Le suicide en France au XVIIIe siècle. Paris: Armand Colin, 2012. 336 pp. Notes, tables, and bibliography. 24.00€ (pb). ISBN 978-2-200-24969-4.